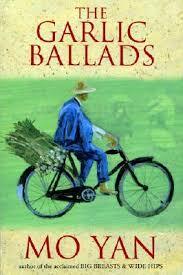 The latest addition to my website is Mo Yan‘s 天堂蒜薹之歌 (The Garlic Ballads). This is a thoroughly grim tale set in Mo Yan’s usual Northeast Gaorni Township. We follow two main characters. Gao Ma is in love with Jinju but her family is determined she will marry a 45-year old wreck and do everything to stop Gao Ma marrying her, including resorting to brutal violence (on both of them) and influence in high places. Gao Ma and Gao Yang get caught up in a riot when the peasants cannot sell their garlic, despite having been exhorted to grow only garlic by the government, and both end up in prison, and both are subject to brutality. Several of the main characters end up dying a violent death, while the others end up far worse off than they were, with no-one living happily ever after.